WOODLAWN — The Strand Hotel will return to life on Saturday when the first tenants move into the 101-year-old former hotel. Holsten Real Estate cut the ribbon on Friday on the $23 million project at 6321 S. Cottage Grove Ave. where efforts at redevelopment were stymied for years. The developers bought the hotel that had sat vacant for 10 years in September of 2014 from the city. 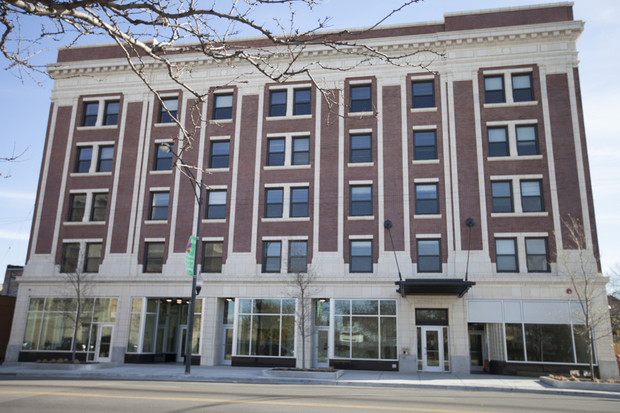 The city pledged $2.7 million in tax subsidies, part of the $12.4 million tax credit package that was necessary to turn the former hotel into 62 rental apartments and new retail spaces. 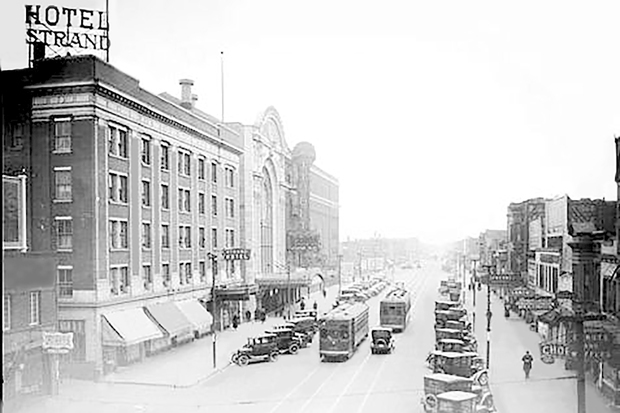 The 80,000-square-foot hotel was built in 1914 with designs by the architects Davis and Davis, who also built Wrigley Field, and played a big part in the neighborhood’s jazz scene for decades. John Coltrane, Sonny Stitt, Sonny Rollins all played in McKie’s Lounge, located inside the Strand Hotel, in the 1950s. David Crosby of Crosby, Stills and Nash told Mojo he used to hang out at the hotel and was musically accosted in a bathroom by John Coltrane, who burst in playing free jazz while Crosby was high. “At that point my mind ran out of my nose in a puddle on the floor!” Crosby told Mojo. The hotel was so legendary that some jazz fans picked over the construction debris for mementos, like the club’s old sign. By the 1970s, the club was closing and Ald. Willie Cochran was starting his first gig as a police officer on a beat that included the Strand Hotel, now half-empty of residents and beginning to fall apart. "My first experience was walking up those stairs and addressing issues that emanated from the building," Cochran said. He said gangs had a solid grip on the building and there were rooms devoted to selling and using drugs. Police officers were watched closely whenever they went into the building. 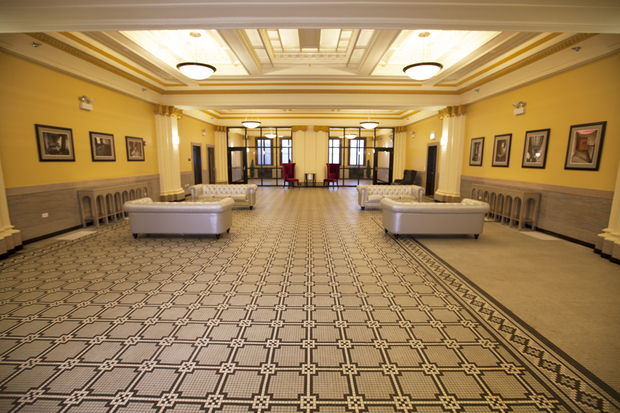 It would be hard to even tell that history in the redone building with its ornate molding completely redone and tile floors cleaned and buffed. The former jazz club is now part of revived retail in the building, including a MetroPCS cell phone store, the Ariel Joseph Art Gallery and Salon and a Subway restaurant run by Shireen Jamil, who sold sandwiches in the hotel 20 years ago. The former club, which still has the indents in the ceiling where stage lights once hung and the original tile floors, will be an art gallery. Bill Lynch said he was shocked to hear about the history of musicians who once played the gallery's new space. "Oh my goodness, I just painted a portrait of Miles Davis," Lynch said. He said he's planning a gallery space to showcase his own work and where his wife can serve her salon clients. He said he's hoping to dedicate a portion of the space for kids in the neighborhood to create and display their own art. 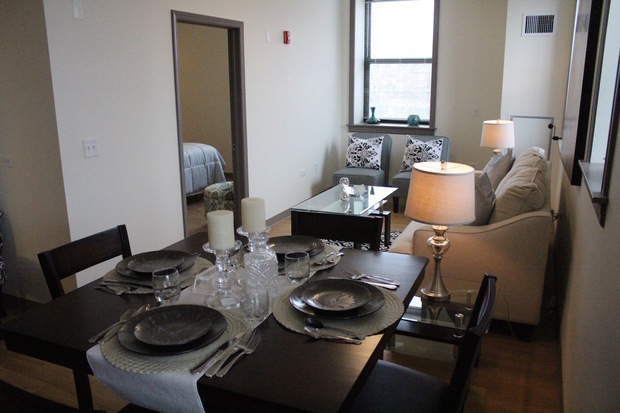 The developers said they’ve had more than 200 applicants for the 62 apartments, which are a mix of one-bedroom and studio apartments renting from $475 to $660 a month. The Strand Hotel was designed in 1914 by the same architects that designed Wrigley Field. The historic lobby maintains some of its details from its glory days.